W hen I first "discovered" my own Mexican paradise, friends "back home" asked "Why San Miguel de Allende?" Sometimes it's hard to explain magic. Who can describe exactly that tingle that tells you you're home? Why does one place resonate so strongly for one person and not for another? But I tried. And I learned that, although some things can't be explained or defined, there are practicalities that everyone understands. 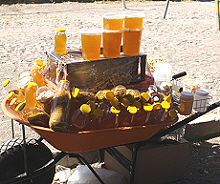 So here are a few of the many "whys" in the Why San Miguel de Allende. The spring-like weather is near perfect for most of the year. The cultural life is incredibly rich, available and affordable. Thanks to the presence of a large and vibrant foreign community and great tourist appeal, our town boasts amenities seldom found in other Mexican towns of comparable size—excellent restaurants for every taste, great music/dance/theater, dozens of art galleries, an excellent bi-lingual library, swinging nightlife. Here's another: scheduling three times longer than you think you'll need to run your daily errands, because you'll be stopped half-a-dozen times by friends as you walk to the library or the bank, have several conversations, and be invited to stop for coffee at least a couple of times along the way. And the fact that no one is ever in a hurry in San Miguel. The days are long and as lazy as you want to make them. For me and San Miguel, it was simply love at first sight. I knew before I even got off the bus that I wanted to live here. Me: "So how did you end up living in San Miguel?" Them: "I came here seven years ago on a two-week vacation and never went home." When I tell people in the U.S. I live in Mexico, they assume I live on the beach. Their mental map of Mexico includes Cancun, Acapulco, Puerto Vallarta, et al, plus maybe Mexico City and not much else. So a caveat: if you're a beach bum, San Miguel's not for you. We're not on the beach! Water we don't have (except for the reservoir, which you probably don't want to swim in). Reasons to Live in SMA: All of the above... plus excellent and affordable health care; good schools for younger children; a chance to experience another culture; many opportunities to learn Spanish; classes to help you learn new skills; groups to help you expand emotionally and/or spiritually; the chance to reinvent yourself and your life, to become a better YOU. So what will your answer be when you plan your trip (or your move) and someone asks "Why San Miguel de Allende?" Share your answer with us. 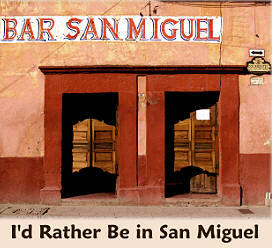 Just click to tell us Why You Love San Miguel. Let's make it personal. Let other people know exactly why San Miguel is special to you. Your answers might be very different from mine...or anyone else's. Please share them with us.